Arugula (pronounced "ah-ROO-ga-la") is a type of leaf vegetable with a flavor that ranges from nutty or woodsy to peppery and spicy. You may also have seen it referred to as "rocket," after the French roquette. Other names include rucola and rugula. Since it grows in the Mediterranean region, which encompasses countries like France, Spain, Italy and Greece, as well as Turkey, the Middle East and North Africa, those are the cuisines where arugula is traditionally used the most. It combines nicely with soft, milky cheeses like fresh mozzarella or burrata, with the spicy flavor of the arugula offsetting the cheese's mild flavor. 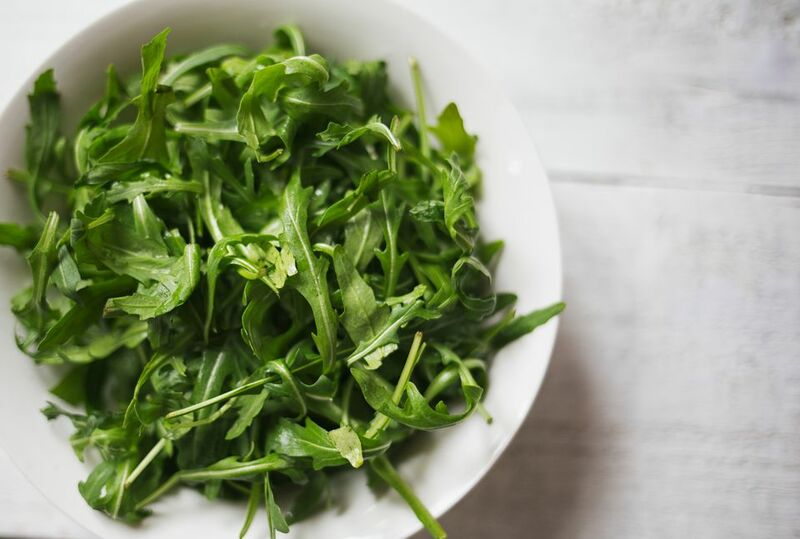 Arugula can be served cooked as in pasta or pizza but is most commonly served in salads, where, because of its strong flavor, it's customary to combine it with other milder salad greens like Boston or bibb lettuces. As for what dressing to serve with an arugula salad or one that features arugula prominently, you can't go wrong with a classic vinaigrette fortified with a dollop of mustard. The pungency of the mustard helps the dressing stand up against the bitterness of the arugula. Another option is a dressing that in classical cuisine was called a remoulade, which essentially is a vinaigrette whisked into a base of mashed hard-cooked egg yolks. The yolks serve as an emulsifier, producing a thick, creamy vinaigrette. For a real treat, try tossing your fresh arugula leaves in a few tablespoons of hot bacon fat, then finish with a squeeze of lemon juice. The hot fat will coat the greens, wilting them just a little while bringing out additional nuttiness. Don't forget to season to taste with Kosher salt and freshly cracked black pepper. Pesto is another traditional Mediterranean preparation that can be tweaked to feature arugula. Usually, pesto is made with fresh basil, which is blended together with olive oil, garlic, pine nuts and parmesan cheese, but swapping out the basil for arugula will produce a slightly punchier take on this old classic. Like all fresh greens, the best way to store arugula is in the fridge, with the separated leaves washed and dried, and layered in a colander underneath a damp paper towel. The holes in the colander ensure proper airflow, which helps keep the leaves crisp. If you seal them up in a bag with no air, they'll wilt faster.